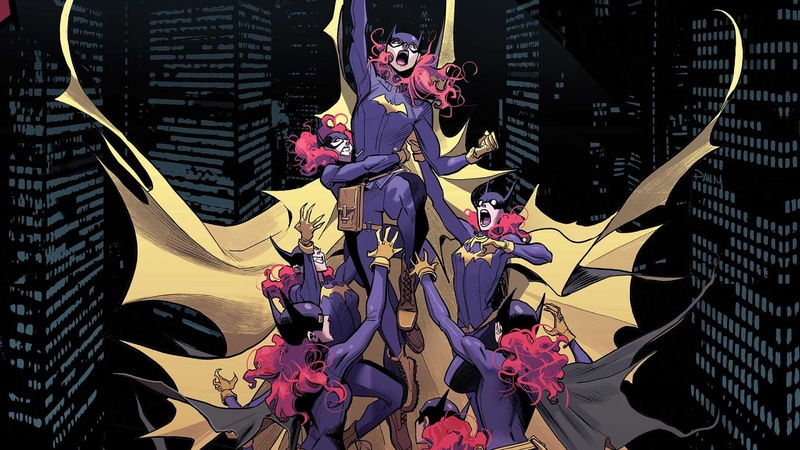 You know, when we left last issue with Batgirl figuring out that she was caught in some kind of recursive loop inside her mind, I sort of thought that was it for the story: she figured out the problem, and it was therefore a matter of time before she broke out of her mental funk and saved the day. 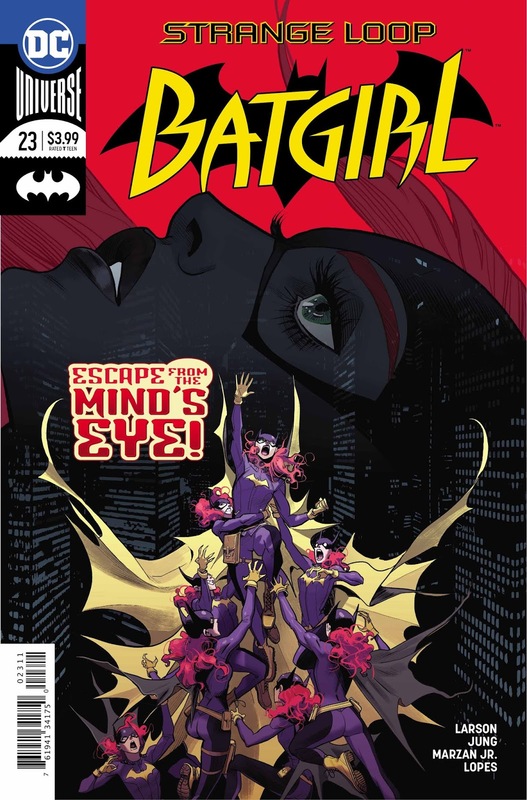 Turns out I was wrong, and here’s an entire issue dedicated to how Babs frees herself from her stinkin’ thinkin’. Uh, if she does at all, that is! 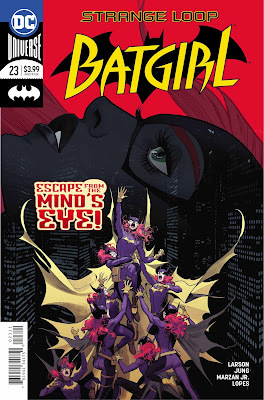 If you want to find out whether Batgirl wins or not, you’ll have to read my review of issue #23! But just to give you a little hint, she does just fine. As described in my intro, it isn’t enough that Fruit Bat explained to Batgirl that she was trapped inside her own mind, she still has to break out of it. I remember in my teenaged years, when tripping on LSD, I would remember to tell myself that I was on a drug, and thusly try to hold onto a semblance of sanity. I’m not sure that it worked, but I figured the same kind of thing might happen here. I mean, the Black Mercy starts loosening its death grip if the victim cottons on to the fact that they’re living inside their greatest dream, but this weird weapon that sent Barbara into some mundane fantasy does seem to work the same way. In fact, there’s an implication that Babs is living in some kind of ethereal version of Groundhog’s Day, running the same lines over and over and floundering within her melon instead of in the third dimensional world. The actuality, however, doesn’t seem to work this way; Barbara faces off against her pal May Hao and…some other woman in an underground MMA fight, but since she is having a lucid dream she bests them handily. She tries meditating her way out of this living dream, to no avail. Then, she gets a call from Carmine Falcone’s daughter: she’s captured Barbara’s dad, Commissioner Gordon, and needs to meet Batgirl in Gotham’s subway! 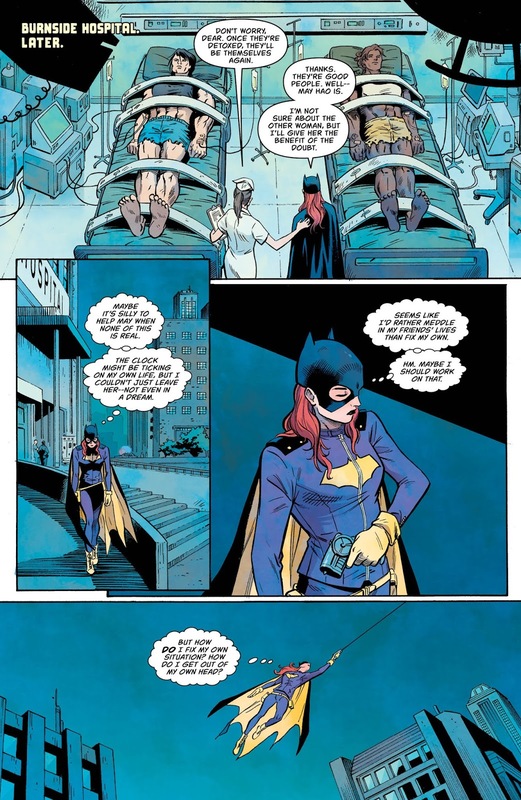 Despite knowing this is not real, Batgirl agrees to meet this girl, Martina Falcone, who wants to be trained as Batgirl’s replacement…or Commissioner Gordon dies. Even though this is an incredibly stupid, contrived set-up, Batgirl worries for a moment that it might be true…then suspects that it’s just her dream escalating things so Babs doesn’t keep trying to escape. She walks away, breaking the “cycle” of things that she would be expected to do, which is not really a cycle at all. 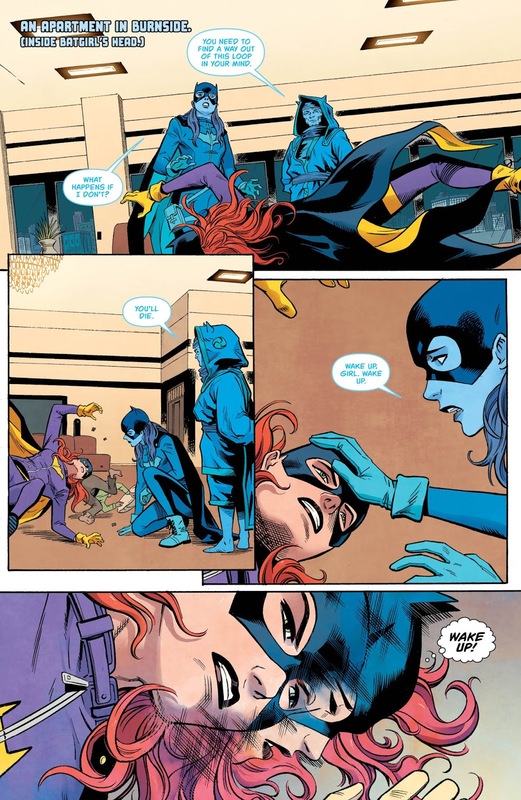 I mean, Batgirl is a hero, she acts heroically. If that’s her rut, then it’s a pretty sweet doldrum because it’s fairly different in every instance. Chase down the Riddler or save a school bus full of nuns? Thwart the Penguin or stop his murder machine from spraying penguins all over Burnside? In the end, Barbara really breaks kayfabe by telling Kai that she’s Batgirl (something I was pretty sure he knew from her time in Asia) and then kisses him on the lips—and this does it! 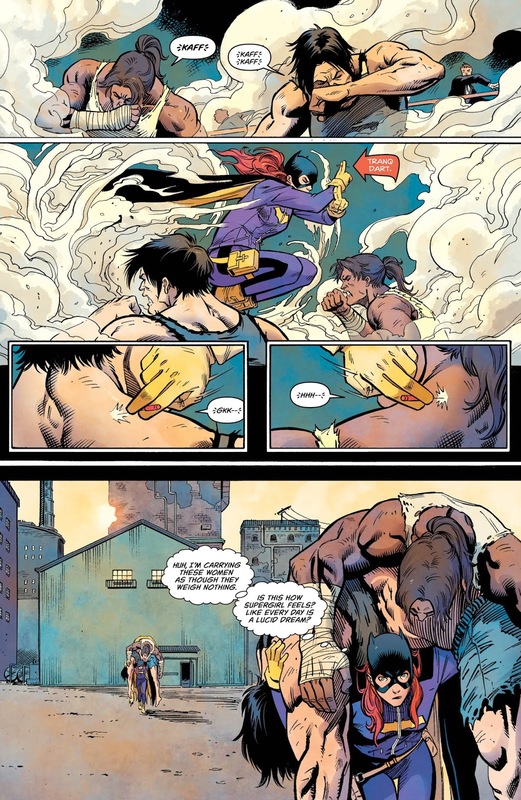 A smooch from her Prince Charming, and Batgirl is back in action, beating down the wife-abusing offender and taking off, feeling like anything is possible. For instance, a creative team change in July. I think that is quite possible. There is a lot of nonsense in this story, lots of fluff that doesn’t seem relevant to anything. That is sort of how dreams are, where everything seems fraught with meaning, but in reality many aspects are red herrings. This, however, is not a dream, it is a story for which people have paid three bucks. I also bristle at the notion that, essentially, a smooch from Prince Charming wakes Sleeping Batgirl from her snooze. This is contrary to the self-assured, independent Batgirl that I know and love…and which, frankly, Hope Larson has never written. If not for the ludicrous moments within the book, like the wife abuser revealing a collapsible, serrated sword from his sleeves before being subdued by Batgirl, then I’d be having no fun with it at all. The tale begun last issue continues into this one, and it's way sillier and will make you more incredulous than before. 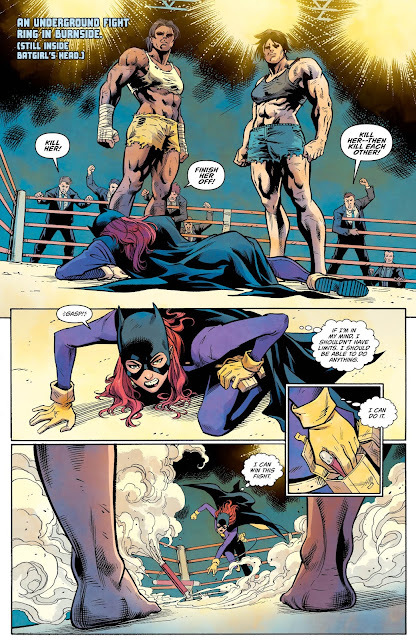 Ultimately, Batgirl is saved by a trite bit of misogyny, which would be unlike the character except as written by Hope Larson. I think the hallmark of this run on the character is that she makes bad decisions where dudes are concerned.